A Different Kind of Mining Fun for the Family | Crystal Water Villas Blog - Lake of the Ozarks! Ready to go mining? We’re not talking dark, damp coal mines, where you’ll have to bring your own pick axe. This is the kind of mining you and your kids will love! 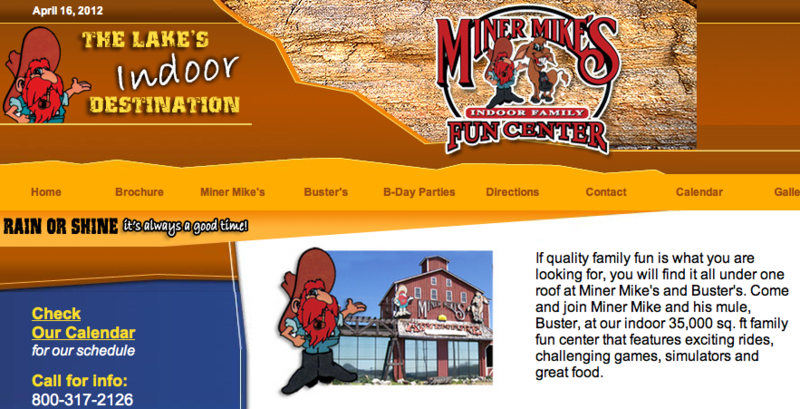 Miner Mike’s is the Lake of the Ozark’s indoor destination that will entertain for hours. This 35,000 square foot family fun center has exciting rides, challenging games, and delicious food. The runaway Mine Train Coaster takes you over dips, bends, and through a rock tunnel! Bump and shake when you give the Gold Mine Bumper Cars a spin. The Miner’s Maze will provide hours of exploration and fun with its tubes, slides, ball pits and power blasters! Let the Chuck Wagon Ferris Wheel take you two stories high. The Longbranch Saloon offers quality pizza, burgers, appetizers and cold beer. Visit Miner Mike’s website to find out more before making a visit. Rain or shine, it’s always a good time!